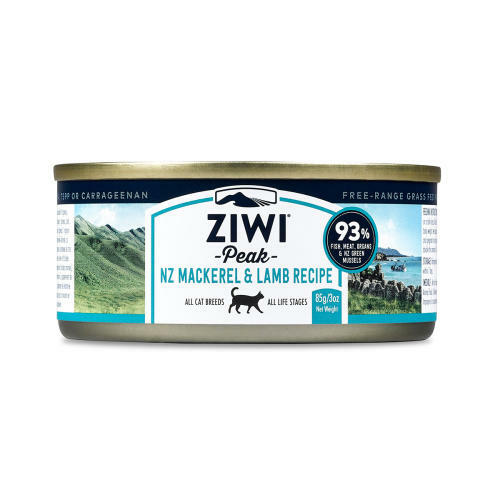 The ZiwiPeak Daily Cat Cuisine Mackerel & Lamb Cat Food is a delicious new addition to the ZiwiPeak range. Hand crafted in small batches, Ziwi recipes use fresh meat, bone and seafood to mirror a whole-prey, nutrient-dense diet that promotes optimum health. They put the best of New Zealand into authentic farm-to-bowl products so you and your cat can share a lifetime of adventures together. Mackerel, Lamb Organs and Lamb (Mackerel, Lamb Lung*, Lamb Liver*, Lamb, Lamb Tripe*, Lamb Heart*, Lamb Kidney*, Lamb Bone), Chick Peas, New Zealand Green Mussel, Dried Kelp, Vitamins and Minerals. *Depending on seasonal availability will be temporarily substituted with sheep. Feed Ziwi to your pet on a daily basis. Adult: For every 3kg / 6.6lb of cat body weight, feed approx 1 can per day. Kittens and pregnant or nursing females: feed approx double this amount in 2-3 feedings per day.